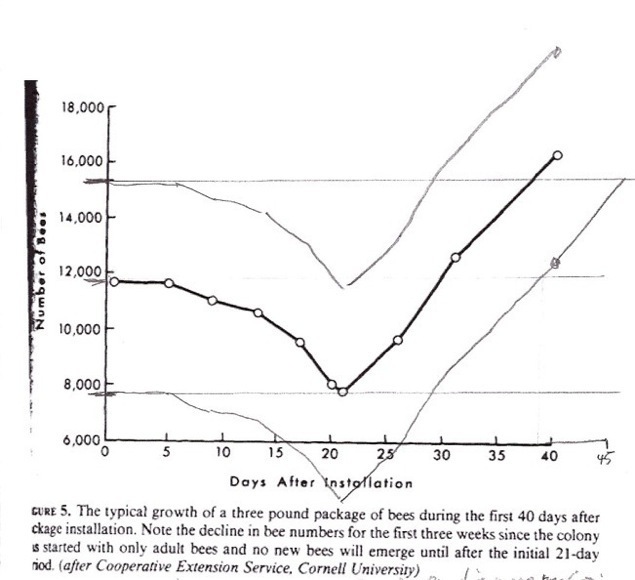 I WILL USE THE GRAPH BELOW THAT I AM BORROWING APPARENTLY FROM CORNELL UNIVERSITY, COOPERATIVE EXTENSION SERVICE. I HAVE ALWAYS KNOWN FROM EARLY ON FROM STUDYING HONEY BEES THAT A POUND OF WORKER BEES EQUALLED 3500 WORKERS. FROM WHAT THIS GRAPH IS SHOWING I AM GUESSING THAT THESE THREE POUNDS EQUALS AROUND 11,750, FROM MY UNDERSTANDING THE NUMBER SHOULD BE AROUND 10,500 WORKERS. OH WELL, GIVE OR TAKE A 1000 BEES OR SO, WE WILL USE THE GRAPH ABOVE TO TRY AND ANSWER A FEW QUESTIONS ABOUT HOW BEES INCREASE AFTER HIVING THEM. THIS QUESTION CAME UP ON AKBEEKEEPERS EMAIL LIST OF BEEKEEPERS IN ALASKA. THE ANSWER I USUALLY GIVE TO A QUESTION LIKE THIS IS; TWO BROOD CYCLES OR A LITTLE OVER 42 DAYS. SINCE IT WOULD TAKE A QUEEN A FEW DAYS TO GET TO LAYING EGGS 45 DAYS WOULD BE MORE REALISTIC. 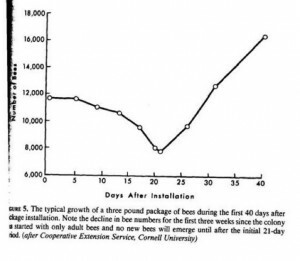 AT THIS POINT A PACKAGE OF BEES WOULD START TO INCREASE TO A SIZE BIGGER THAN IT STARTED OUT. BELOW I MODIFIED THIS GRAPH ABOVE TO REFLECT THREE DIFFERENT SCENARIOS, A TWO LB., THREE LB., AND A FOUR LB. PACKAGE OF BEES. ON THE GRAPH ABOVE I HAVE DRAWN THREE LINES, YOU CAN ONLY SEE TWO GOOD LINES BUT THERE IS ONE GOING HORIZONTAL FROM THE STARTING POINT OF THE THREE POUND PACKAGE. 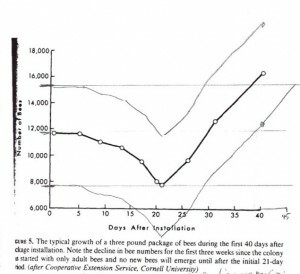 ON THE GRAPH THE FOUR POUNDER DROPS IN NUMBERS TO WHERE THE THREE POUNDER STARTED OUT AT IN 21 DAYS, AND THE SAME THING THEORETICALLY SEEMED TO HAPPEN TO THE THREE POUNDER TO, DROPPING IN WEIGHT TO THE NUMBER THE TWO POUNDER STARTED OUT AT. FROM THIS GRAPH YOU CAN SORT OF MAKE UP YOUR OWN MINDS AS TO WHAT MIGHT HAPPEN. PERSONALLY I THINK REALITY MIGHT DRAW A DIFFERENT PICTURE. YOU COULD ASSUME THAT THESE BEES WERE HIVED IN A STANDARD LANGSTROTH DEEP HIVE BODY USING TEN FRAMES AND THE COMBS MIGHT HAVE BEEN DRAWN OUT, I CAN ONLY ASSUME. SOMETIMES YOU HAVE TO DO THAT, ASSUME, TO MOVE ON. I HIVE PACKAGE BEES INTO MY HOMEMADE NUCS OR IN THE POLY NUCS BETTERBEE.COM SELLS. I HAVE FOUND THAT BEES INCREASE TO LARGER NUMBERS FASTER THAN THEY WOULD HAVE IF HIVED IN THE STANDARD WAY I DESCRIBED ABOVE. I BELIEVE THIS IS POSSIBLE BECAUSE OF THE CONFINED SPACE IN THE NUCS AND THE FACT THAT THEY ARE INSULATED BY POLYSTYRENE THE WORKERS CAN COVER A LARGER BROOD AREA. 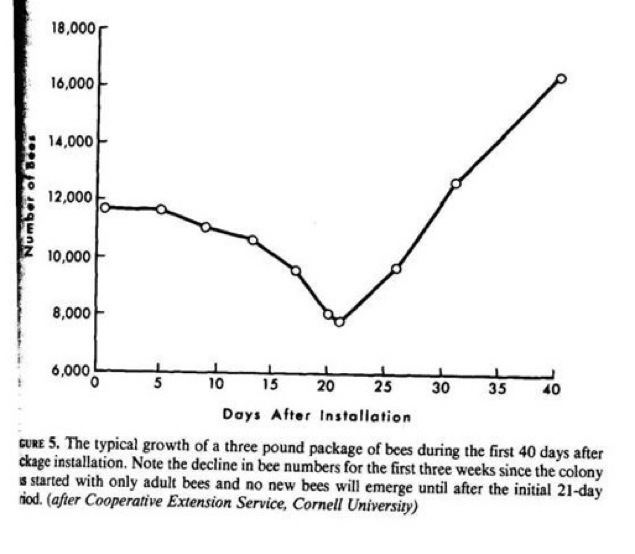 THE INSULATION AND CONFINED SPACE IS LIKE SOMEONE ADDED EXTRA BEES TO THE REAL NUMBERS ACTUALLY THERE. IT IS LIKE THEY HAVE AT LEAST AN EXTRA POUND OF BEES IF NOT TWO. ANOTHER WAY TO ACCOMPLISH THE EFFECT OF ADDING MORE BEES TO A PACKAGE BEE AFTER HIVING INTO A TEN FRAME DEEP OR SHALLOW BOX IS TO INSERT INSULATION FRAMES TO EACH SIDE OF THE CLUSTER. THESE ARE MADE USING AN EMPTY FRAME, WITH NO FOUNDATION OR COMB, AND PUTTING IN PLACE OF THE COMB A CUTOUT PIECE OF 1” BLUE OR PINK POLYSTYRENE. HOLD THESE BOARDS INTO THE FRAME BY USING GALVANIZED 6 PENNY NAILS PUSHED INTO THE HOLES THAT ARE IN THE END BARS OF THE FRAME THAT USUALLY ARE USED TO WIRE A FRAME. THESE INSULATION FRAMES, OR FOAM BOARDS, CAN BE WORKED TO THE SIDES OF THE BOX AS THE CLUSTER EXPANDS REPLACING NEXT TO THE CLUSTER A REGULAR FRAME. HOPEFULLY I CAN GET A PICTURE SOON PUT UP HERE TO ILLUSTRATE THIS FRAME. YOU CAN MAKE UP YOUR OWN MINDS, I WILL CONTINUE HIVING BEES IN THESE POLY NUCS AS THEY WORK GOOD HERE IN ALASKA, AND I WOULD THINK THEY WOULD EVEN WORK GOOD ANY PLACE ON EARTH. I WILL ADD TO THIS DISCUSSION IF I THINK IT IS HELPFUL.